I read somewhere that MongoDB is the database for the modern web which induced a thought in me that what’s so special about this new database that everybody is talking about it and believe me when I started digging into this I really got impressed. So this article is dedicated to great MongoDB. In this article we will learn basics about MongoDB. I have tried to make things easier and clear to understand. I hope in the end of this article you will have enough understanding about MongoDB. MongoDB is an open source document oriented database. MongoDB falls in the category of the NoSQL – Database which means it doesn’t follow fixed schema structure like in relational databases. 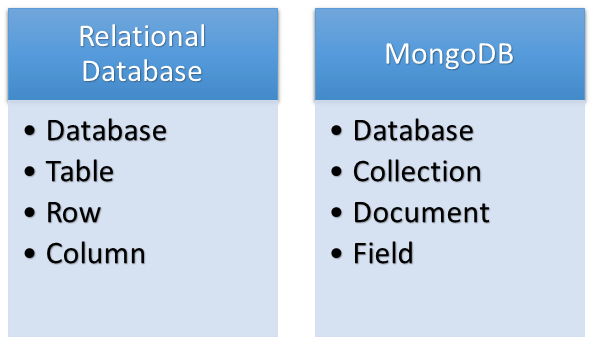 MongoDB cannot replace Relational databases but it should be viewed as an alternative to it. MongoDB can be installed on Windows, Linux and MAC so it is a cross platform database. It doesn’t support joins but it can represent rich, hierarchical data structures. And of the best feature the like the most is that it is easily scalable and can give high performance. Let’s install MongoDB on windows to dive into the world of MongoDB. 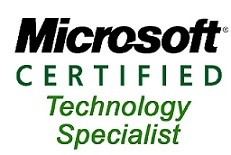 Note in this article we will see the steps to install MongoDB on windows only. Head over to the official website of MongoDB (http://www.mongodb.org/downloads) and grab the latest the latest version of MongoDB. If your windows system is 64-Bit then download the 64-Bit version else download the 32-Bit version.Note: 32-Bit versions of MongoDB support databases smaller than 2GB so they are suitable only for testing and evaluation purposes. Run the setup (.msi) downloaded. By default MongoDB will be installed in C: drive. Create a directory named data in the C: drive and then create another directory named db in data directory. All the databases get stored here. Set the path of MongoDB (C:\Program Files\MongoDB\Server\3.0\bin) in environment variable. 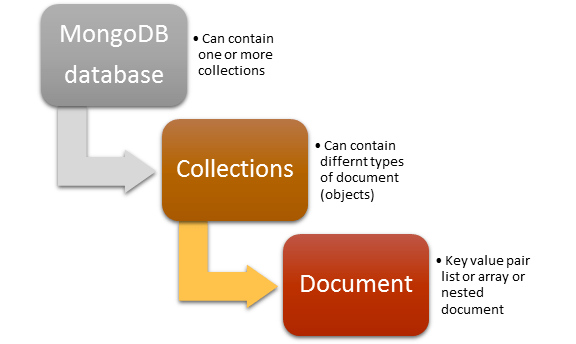 If you followed above steps then your MongoDB is up and running to create our databases and collection. Above document contains information of a student in the key-value pair. It contains unique _id for the record, name and its value, class and its value, subjects and its value is in the form of array, address contains its value in form of another in-document and grade contains its value in form of arrays of documents. If we have to represent the same record in Relational world then we would require at least three tables. 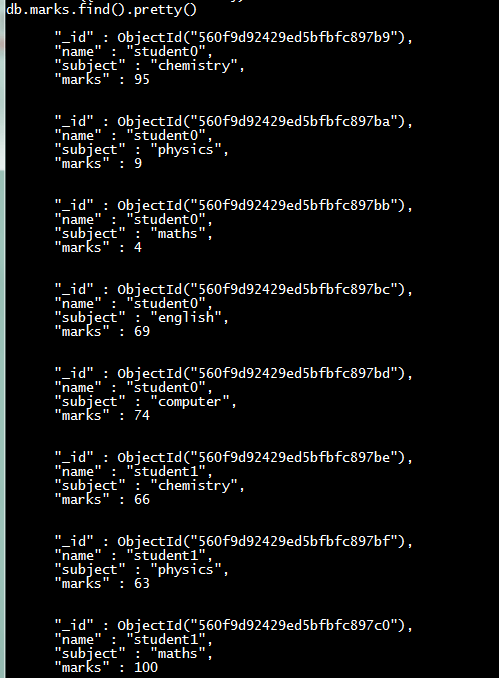 One to store basic information like _id, name, class, address and another to store subjects and another one to store grades etc. But here we stored the whole relational information in one complete document this is how we managed the deficiency of joins and constraints in MongoDB. 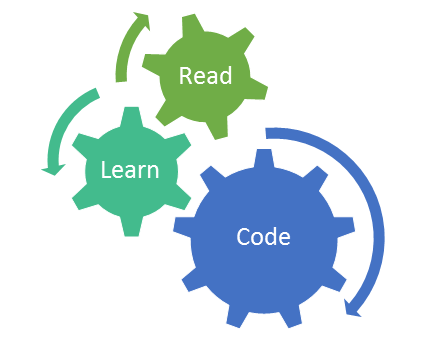 In MongoDB we do not have joins but it’s up to us the developers how we are designing our schema to manage relations. I hope this would have given you the basic idea of document-oriented data model. Let’s see how we perform CRUD operations in MongoDB. If you have successfully installed and setup the environment variable of MongoDB then you are ready to start MongoDB. 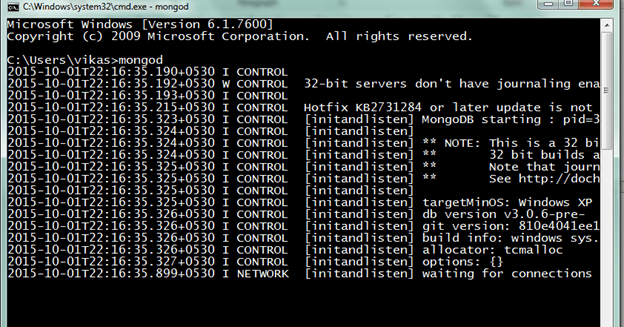 Open the command prompt of windows and type ‘mongod’ to start the MongoDB server. MongoDB server will get started, you will see the message ‘waiting for connections’ at the end of the screen and cursor will be blinking this means your server has been started and waiting for connections from MongoDB clients. Now open another command prompt and type ‘mongo’ to make connection to the server. Remember don’t close the first command prompt. In the MongoDB shell type ‘help’ and press enter then you will see bunch of helper functions that MongoDB provides for us. Well we talked a lot now it’s time for some action let’s see some commands now. show dbs : will show the databases in your system. show collections : will show the collections in a db. db.help() : will show the help on db methods. db.mycoll.help() : will show the help on collections methods. Type use [database name] and press enter if the database exists the MongoDB will switch to database else it will create a brand new database for you. 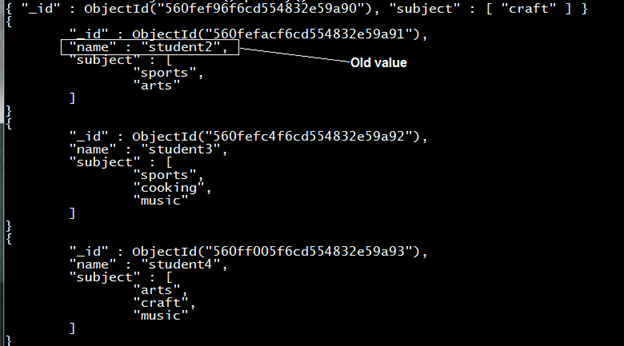 For example : type ‘ use students’ to create a database named students. We have already created our database now it’s time to create our collection. So how do we create collection it’s as easy as eating pie just use insert command. Let me show you. Here mycol is the name of collection and we have inserted a document in it. We just have to write the name of collection and insert record in it MongoDB will automatically create collection if it’s been not created else will insert the record in the existing collection. Insert command is used to insert documents in a collection as we know document in MongoDB stores JSON object as document so insert command accept JSON object as parameter. 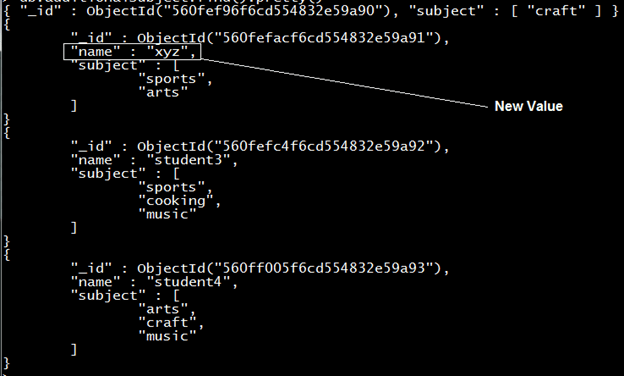 Here we created an object named doc and used that object as a parameter in insert command. 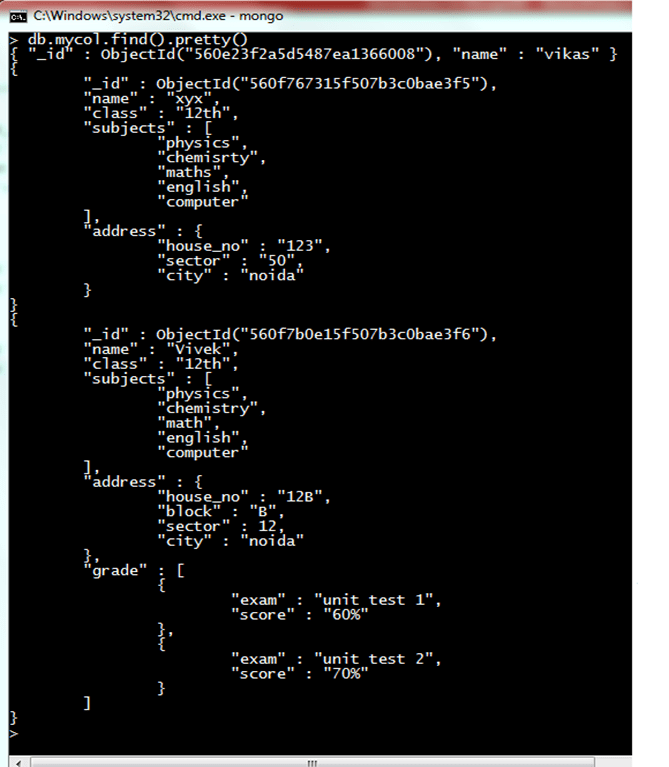 If you type the command db.my.col.find() you will see all the records inserted so far. 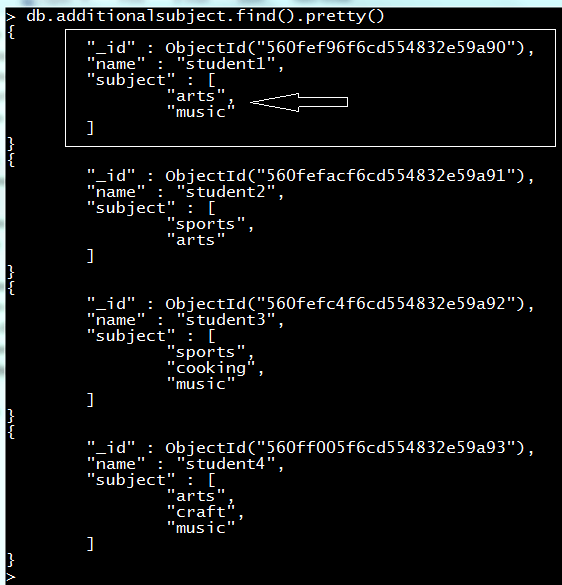 Note if you type the db.my.col.find().pretty() output displayed will be well indented and formatted. When we insert a document in MongoDB, server require that all documents coming have a unique identifying field in fact it uses _id for that. The _id field in a document is a primary key which means it requires that the value of _id field should be unique. _id field is immutable which means you cannot change it. ObjectId is a type to generate unique keys which takes current time, identifier for the machine that constructing the ObjectId, the process id of the process that constructing the ObjectId and the counter that is global to object that constructing the ObjectId, by pushing these information together MongoDB creates a unique id for us. Of course we can create our own _id field but for every other document it must be unique. So we have seen that how we can insert documents in MongoDB which means we have completed our C part of CRUD operation let’s move to next part. To use find() command to query our collection we need some more records to see various form of find() command so let’s insert some more records in our collection. I have used the below command to insert 100 records in one go. Note: I have used indentation just to make code readable but when you write the above code in MongoDB shell please remove all tabs and spaces. Now we have a collection named marks and it has 100 records in it. We have used find() command earlier also but I didn’t explain how it works so let’s see how it works. Find command takes a pattern matching parameter to match its corresponding records just like where in Select query in SQL. If you write SELECT * FROM Table in SQL it will give you all records in a table similarly if you write db.CollectionName.find() it will return all the records in the collection. Here we passed two condition to match our document that is name should equal to student0 and subject should equal to computer. find command takes an object as a parameter similarly we will also pass document to match condition that is marks should be greater than 50. $or takes an array of criteria that needs to be matched. 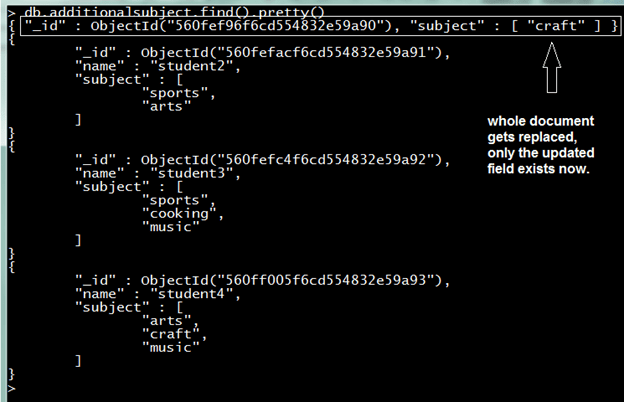 similarly, we can write $exists : false for records in which class field doesn’t exists. 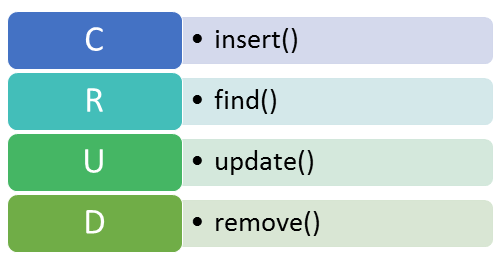 The important thing to notice here is that $all will look for all the values passed in the array irrespective of the sequence they are present in collection. update command in MongoDB performs four major tasks. It will not only change the subject field but will replace the whole document. Now there is no name field only ObjectId and subject field, so we can say this is not the right way to update a document because updating in this manner will replace the whole document with new updated value but this command is useful when you want replace the old document with new fields and new values. Update command searches for the record that matches the criteria specified in the parameter and if finds the record then it updates it otherwise nothing is updated. We have a special operator upsert that creates the new record and then update it. So if we will try to update the record of student5 nothing will happen because we do not have student5 record but if we use upsert then a new record for student5 gets created and updated. It will add one more subject ‘sports’ at the end of the subject field. Similarly, we have $pop to remove a value from the array. But it will remove the rightmost value from the array. It will add a new field class to every document in the collection. So we are done with update commands. Remove command is used to remove records from collection it works same as find command it requires one parameter which is the matching criteria for the document. And we want to remove all documents of a collection then we have to pass an empty document as a parameter to the remove command. It will remove all the documents of collection. We used MongoDB to create our database and then we created our collection and learnt CRUD operations on our collection. I hope you have enjoyed this article. You will realize the real power of MongoDB when you start using it.